The Apple “Genius” job description is online here, if you live within commuting distance of Newcastle and like the idea of a job where you show endless idiots how to listen to MP3s on a telephone. You’re fascinated by the way things work and the reasons they sometimes don’t. You sometimes rearrange your computer setup just for fun. You were the kind of kid who took things apart just to put them back together (correctly). If this sounds like you, you’re our kind of Genius. You’re here not only to help fix equipment, but to restore positive customer relationships with free technical advice and timely repairs. You provide white-glove treatment to customers. You enjoy meeting people and building relationship with customers. Your friends and family see you as an absolute technical guru. You have some background in tech support or customer service. You have a burning desire to solve problems. You can communicate technical concepts in layman’s terms. You have a sense of urgency—but also the ability to keep your cool. Solving problems—things happen and you’re there to fix them. Providing frontline customer support at the Genius Bar, including hardware and software troubleshooting and diagnosis. Troubleshooting and repairing Apple hardware and software. Juggling customer and product issues with a genuine sense of urgency. Turning around repairs to customers as quickly as possible. Being one of the go-to people for technical knowledge in the store. Having passion about customer service and a commitment to exceeding expectations. 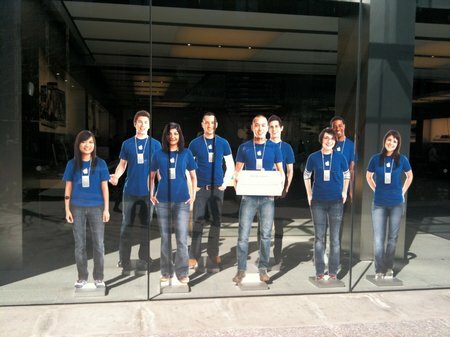 A job at an Apple Retail Store is a chance to use your hands and heart. To use your knowledge and experience. To contribute meaningfully to people’s lives with your technical know-how. To delight. Enrich. Impress. Engage. Inspire. Are you ready to join the retail revolution? We’re not looking for a job, by the way. We’re perfectly happy being in charge of this listing kingdom. A brilliant gonzo street find from semi-pro comment-leaver “Courtster” here, which reveals several ALL-NEW Apple Specialists we have not yet catalogued and are yet to see rolled-out to EMEA regions! His report’s a bit long, but bear with it – he got out his camera and took a photo in the street for this. That takes GUTS. “I hope I don’t come over too drunk in this mail, as I am in the Boston Airport BA lounge getting royally steaming before the flight home – don’t listen to that guy from Die Hard who tells John McClane that the only way to survive air travel is to ‘make fists with your toes’ – It’s booze, lots of booze. iPhone. So no need to get excited about the EXIF data. “Boston was great by the way. It’s much friendlier and accessible than NYC. I recommend you all go. There’s even a CEX there so you can buy overpriced stolen phones the other side of the Atlantic too” – Courtster. Yes, we still have so little to do that receiving an email from Apple about its new Valentine Day promotions is exciting, just in case there’s a new Specialist. Looks a bit rough. Doubt they’ll let this one meet customers at the ‘Genius Bar’. He looks like a backstage box-shifter. “Take this lady’s MacBook out to the car, please, Dave”. How’s this for a new idea for a thing to do ? Imagine how gutted you’d be. The initial joy of that CRISP, clear digital LCD clock would be smashed into a thousand pieces when you finally fish that sorry excuse of a remote control out of the bottom of the box. It’s such a rubbish remote, you might almost throw it away thinking it’s just a bit of padding. There’s potential for at least three Gadgets with DISAPPOINTING REMOTE CONTROLS updates before we get bored of it and forget all about it. New MacBook Pro, new Apple Specialists! DOUBLE TEAM! Although the photograph is a bit too sterile to imagine them doing anything of a sexual nature together. We are unsure as to the meaning of these newer, darker blue t-shirts. And wouldn’t it be nicer if they’d localised the name and called it the “Apple Shop” in the UK? How extremely apt. Sadly for Brighton, this event is not deemed exciting enough for Apple to bust out any new in-store photography. We have just learned the people in the orange t-shirts are called the in-store “concierge” though. This five minutes has not been a complete write-off. It’s here, where the crack-heads from the North of the city uncomfortably meet with the web designers from the South in one huge mass of styled hair. Another new Apple specialist. Clearly Apple’s latest product line refresh also came with a bit of budget for photography. If you are one of our six confirmed female readers he is going to be your favourite. Steve then says “Sure, let me show you” and moves in really close to demonstrate the correct operation of the ladies’ iPhones and iPods. He is so used to being around women and close to women that it’s not even a big thing for him. We are not jealous, we just naturally know not to bother looking up from the ground if there are any Steves around.